My experience with UK Study Tours. My girlfriend and I booked a day trip with UK Study Tours. In the description of the tour, it was written "you will spend about 2 / 2.30hrs in Stonehenge and after that you will go to Bath. Then you will return to Bournemouth at around 8"
The cost of the trip is £30 for each person. Instead of the 2/2.30hrs we spent 1.30 hours in Stonehenge and we came home around 6.30pm. 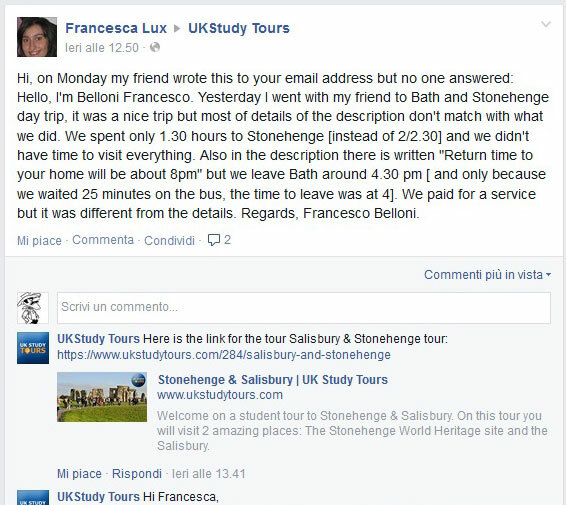 I wrote a short email to UK Study Tours to know why, and after 5 days no one had answered me. We published the same question on their Facebook page and they replied immediately to us saying that we were wrong. They said that we had read the information on the website wrong. I wondered how because before I wrote to them I checked twice! In fact, they had actually changed the contents of the description on the website after we had complained about the wrong times. So instead of explaining to us that the times were wrong on the site, they changed the information and made us look like fools. 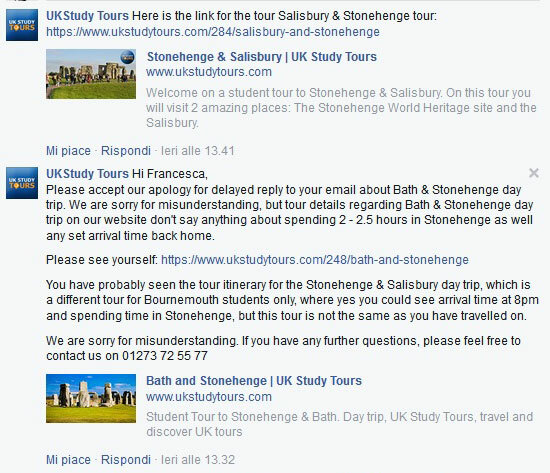 There is a website archive.org which remembers many websites and luckily we were able to go back to the original description informing UK Study Tours that they had changed the description AFTER the complaint instead of answering our question in an honest way! Obviously after such treatment we wanted a full refund of the trip although they continued to propose discounts or free day trips to repay the incident. 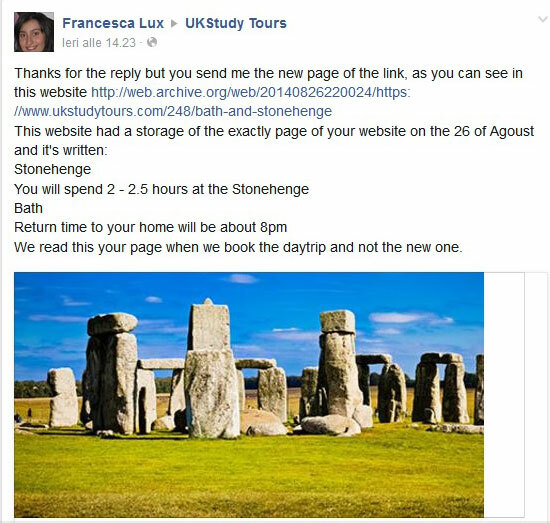 Since we spoke to them they have done the following: they have blocked access to the page of the original article: http://web.archive.org/web/20140826220024/https://www.ukstudytours.com/248/bath-and-stonehenge [directly from their website by setting a parameter of robots.txt], deleted our posts and blocked Facebook users from being able to write on their Facebook page! From this experience, we lost £60 and a lots of hours but I wanted more people to know what happened to us. I am attaching the photos that I've prudently taken from their Facebook page and the various emails we exchanged with UK Study Tours. Ive heard you had made enquiries about the timing on the Bath & Stonehenge tour which were different to what was on our website. Due to us being nearer Stonehenge and Bath than other departure regions it does return earlier. Normal departure time is normally 4.30 to 5pm if we leave Bournemouth at 9am but recently we have left earlier such as 8.30am which means we might be leaving earlier from Bath. If you can get back in touch with me i can arrange a discount on another tour though if you wish to come somewhere this weekend. I have available seats on Cambridge and Oxford and Windsor tours on Saturday. I could do £10 each on these tours which you can pay on the morning to the guide or myself. I don't think you are understanding us correctly and we want to be very clear - your website and the tour that we chose had the details about the tour being from 8.30am to arriving back in Bournemouth at 8pm. When we were on the tour we were told that we have 2 / 2.30 hours at Stonehenge but we actually only had 1.30 hours. Therefore, we not only arrived back earlier than expected at 8pm time - but we also had much less time at Stonehenge and Bath than we paid for! After we spoke to you about this - you changed the details on your website to suit yourselves. We have already provided a link of the cached version of the site proving that you changed it rather than have an honest conversation with us. Since you are unable to be honest with us - we cannot accept a discount as we are uncomfortable travelling with a tour group who has been dishonest about the times of travel (and then tried to cover it up). We would like a full refund for our trip. We will be forced to take this further if you cannot give us our refund. The website itinerary is for all students from all departures and covers everyone up to the latest time possible. We have removed timing to avoid confusion and are not being dishonest. As I wrote in Facebook the extra time allowed for Stonehenge was no longer needed after they stopped the land train for groups and used shuttle buses which meant less delay waiting in a queue. Before the visitor centre opened we only normally needed an hour and is now increased to see the exhibition as well. We have a 2hr journey home from Bath whereas other students can take 3 or even 4 hours to return to the east side of England. We have plenty of space on the Cambridge tour tomorrow and you and a friend can go free. It departs at 8am from the interchange and have reserved 2 seats for you if you wish to go. I'm sorry but you are saying a lot of things which don't match with the description we paid for. We don't want accept your discount-free tour to Cambridge because we don't want to travel with you anymore, we will feel uncomfortable. If you cannot give us our refund I don't want to waste my and your time anymore but I let you know I'll report this our experience to Bournemouth council, local authority tourism officers and some newspapers. I've just heard from our guide that day and she said you arrived at Stonehenge at 9.30 and we're given till 11.30 as departure time so you were given the 2 hours there not 1.5 as you said. It's a shame you won't take our offer of a free tour to Cambridge. It's a different guide so you don't need to feel uncomfortable. Considering the long journey time this tour will get back at 8pm and earlier for other regions that are closer, so the reverse of what happened last time. about stonehenge it's not true because we arrived there at 10am and left at 11.30 . We remember it very well because we ran ( for 15 minutes) for be on time at 8.15 but we left the bus station around 8.45 ! Thanks for your offer but we'll feel uncomfortable even with another guide. The big problem for me is someone changed the informations in the website instead of trying to fix the problem with us. It was not nice. As I wrote in the last mail, if you cannot give us our refund I don't want to waste my and your time anymore but I let you know I'll report this our experience to Bournemouth council, local authority tourism officers and some newspapers. sorry but you have not replied, can you give our refund or not? 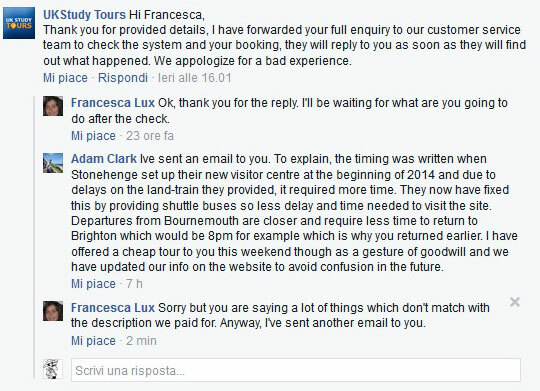 Sorry we cant give a refund for a tour that happened without any cancellation or significant delays or problems such as coach breakdown or no entry to stonehenge - that would be the only reason we could do a refund. Im still happy to offer a free day tour instead. Most tours are available this weekend if you choose quickly. We moved to Liverpool so we can't do any of your tours but I was thinking changed the details on your website to suit yourselves was enough to have a refund but thanks for your collaboration anyway. I let you know, I'll write our experience to some tourist government office and bournemouth newspaper.